Medical research always tends to benefit mankind by implementing the use of current technologies and research to cure a person and providing an ailment free life. Research activity pertaining to Medical sciences is a rapidly evolving area that owes much to the basic biology and claims high importance in understanding and accelerating the research in the associated subjects. The modern medicine discipline is wide enough to accommodate multiple disciplines and sub disciplines with several specialties. This periodical emphasizes to publish articles in all aspect of medical research covering the basic scientific aspects, medicine and associated topics and advanced research which will be contributing to the future of medicine. Allied Journal of Medical Research is a peer-reviewed, open access journal designed for the wide dissemination of research in the field of medicine to worldwide audience. Medical Research covers the basic, applied and translational research conducted so as to aid and build knowledge in the field of medicine. 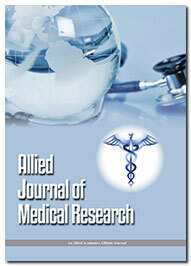 This journal publishes articles from all areas of medical research of international interests. With an emphasis on conceptual breakthroughs and current trends, its goal is to facilitate towards developing new medicines and improving the application of the medical procedures, thereby improving the quality of life for the Human population. Journal of Medical Research has a broad area and is not only confined to surgery, internal medicine, infectious disease, orthopedics, obstetrics and gynecology, oncology, and neurology. But, instead can include articles from the related fields such as studies in clinical areas like immunology, biophysics, translational medicine, personalized medicine, anesthesia, cardiovascular medicine, complementary medicine, dentistry, pathology, pharmacology and therapeutics, dermatology, respiratory medicine, rheumatology, drugs and medicines, nutrition and metabolism, endocrinology, gastroenterology, geriatric medicine, hematology, psychiatry, radiology, pediatrics, urology, epidemiology, ethnic studies. The Journal is using Editor Manager System for easy online tracking and managing of the manuscript processing. Each article undergoes a peer review process under the aegis of an assigned Editor. To be acceptable for publication, an article should be positively considered by two individual reviewers followed by the Editor’s consent. Authors looking forward to submit important articles containing advanced research output aiding in forwarding the subject are most welcome. The wide scope of the journal will aid in contributing a great measure of scientific information related to the advances in towards better healthcare.